Last year European people opened their doors to asylum seekers as the Syrian refugee crisis worsened. Germany took in 1.1 million refugees alone. The wave of refugees is continuing. At least 100,000 arrived in Greece in the first two months of this year, with 2000 more joining them every day. But governments across Europe are now moving to restrict the arrival of refugees. Macedonia, Slovenia and Croatia have closed their borders, preventing refugees moving from Greece through to permanent resettlement countries like Germany and Sweden. Austria too has moved to seal its border and announced a cap on arrivals of 37,500 this year, less than half the number that arrived last year. Denmark has cut welfare benefits to refugees by 45 per cent and delayed family reunions by three years. Shockingly, it is also seizing any valuables carried by refugees above $2000 value at the border. Switzerland and some southern German states have introduced similar laws to confiscate belongings. This is reminiscent of measures taken in Nazi Germany against Jewish refugees. Sealing off the borders is trapping increasing numbers of refugees inside Greece. Despite its own desperate economic situation, the majority of Greeks continue to demonstrate a deep compassion and support for the refugees. In early March 10,000 people in Athens contributed eight truckloads full of food and clothes, as part of a public event in Syntagma Square. In many places government services for refugees are in a state of collapse, with volunteers filling the gap. Manolis Tzanetos, who runs a company serving meals to refugees on Lesvos, has continued the service despite government funding being cut off in September. He has kept providing free meals with support from NGOs and volunteers. In Greece the efforts to divert anger about jobs and the collapse of public services onto refugees have failed. This is a testament to the anti-racist movement that has isolated the fascist party Golden Dawn and the continuing impact of the massive strike movement against austerity. There are 14,000 people waiting at the Macedonian border and at least 30,000 in Greece as a whole. Thousands are living in tents at the border town of Idomeni in muddy fields and alongside railway tracks. “Many people here are soaking wet and cold from having to sleep out in the open, it still dips below 10 here during the night,” said Caroline Haga from the International Red Cross. There was strong support for the refugees across Europe late last year when large numbers began arriving. A poll in Britain in September showed one in three people had donated money or time to help refugees. Recently attitudes have hardened, with the number in Britain saying the country should accept more refugees dropping from 40 to 24 per cent. This is a result of efforts by right-wing politicians and the media to stir up racism and xenophobia. The far right in Germany seized on sexual assaults carried out on New Year’s Eve in Cologne to campaign against refugees. In Sweden there has been a racist scare campaign about refugees committing rapes and other crimes, yet statistics show they have been responsible for just 1 per cent of complaints to police since September. But this is being contested across Europe by anti-racist campaigners. Major anti-racist demonstrations are taking place on 19 March in Greece, Britain, France, Poland, Spain, Austria, Denmark, the Netherlands and Germany. Even President Angela Merkel in Germany, who was widely praised last year for her decision to allow refugees in, now wants to stop more coming. European governments say that they simply cannot cope with so many refugees. There are now over 4.5 million refugees who have left Syria alone. Refugee arrivals in 2015 were unevenly distributed, with some countries refusing to take any substantial number. Clearly countries like Britain, which says it will accept just 4000 additional Syrian refugees a year, could do more. But even the two highest intake countries in Europe are still well within their means to cope. Sweden accepted 190,000 people last year, which equates to 2 per cent of its population. This is exactly the same growth rate the Australian government aimed for in the years following the Second World War. Even today Australia’s population is still increasing at a rate of 1.4 per cent a year—because of both migration and new births. Germany’s intake of 1.1 million refugees last year was around 1.4 per cent of its population. The European Union is one of the world’s richest areas, with an economy estimated at $18.5 trillion a year. It can easily afford to help these refugees. It is clear that this massive movement of people is driven by the need to escape death and impossible living conditions, not simply the prospect of a better life. Almost 80 per cent of refugees that reached Europe in 2015 were from just three countries: Syria, Afghanistan and Iraq. This surge in refugee numbers is a result of the devastating wars in the Middle East, showing that it is overwhelmingly “push factors” that drive global movements of refugees. 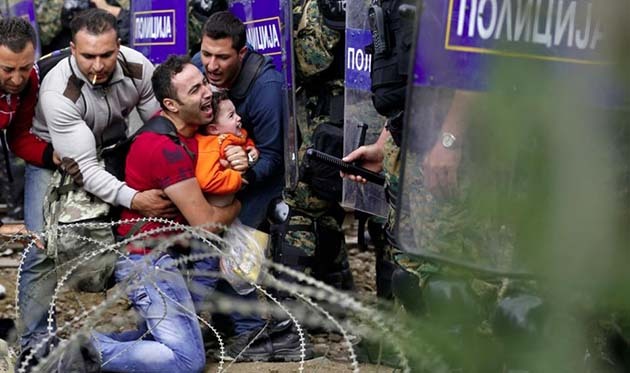 Syria, responsible for half of all refugees in Europe last year, is a human tragedy of immense proportions. It is clear that the millions of Syrians are genuinely in fear of their lives from war, starvation and terror. The situation shows the need for open borders—and how it is possible. The alternative to Europe, and other rich countries like the US and Australia, opening their doors is to leave much poorer countries bordering Syria like Jordan, Lebanon and Turkey to cope. This is exactly what European governments are now demanding. The EU has signed a deal with Turkey to take back refugees who try to enter Europe in exchange for $8.8 billion in aid to help pay its costs. Europe says it will also accept another refugee in exchange for every one sent back—in a move similar to the failed Malaysia people swap deal proposed by Julia Gillard. Turkey is following their example, attempting to close its border with Syria to stop refugees fleeing the fighting in Aleppo. Conditions for the 2.5 million Syrian refugees in Turkey remain poor. In January the government announced plans to make it easier to apply for a work permit. Five years after the Syrian crisis began just 7300 work permits had been issued. Refugees without a permit have to try to work illegally, and therefore face exploitation and low wages. No wonder so many want to get to Europe. The efforts to keep out refugees are also causing deaths at sea by making the journey more dangerous. A razor wire fence built at the land border between Turkey and Greece to keep people out forces refugees to travel by boat across the Aegean and risk drowning. Last year 3770 people died in the Mediterranean, including 805 crossing the Aegean Sea from Turkey to Greek islands. In November footage emerged of a Greek coastguard vessel attempting to sink an inflatable dingy with 60 refugees on board. The Greek vessel then sailed away and left the boat to be rescued by the Turkish coastguard and returned to Turkey. Human Rights Watch has also raised concerns about armed, unidentified masked men attempting to disable boats and return them to Turkey. In recent months patrols of the sea border have been stepped up, with EU border agency Frontex joining Greek government patrols and NATO sending warships to assist. This rhetoric, and the efforts to “stop the boats”, mirror the policies of the Australian government. But people smugglers do not drive refugees to seek protection—they spring up in response to the need to escape war and persecution. Refugees throughout history have been forced to use people smugglers when government put up barriers to their escape. Australia’s response to the Syrian crisis has been as miserly as anywhere. The government has accepted just 26 Syrian refugees in five months, despite agreeing to provide 12,000 additional places. Canada has already accepted over 20,000 refugees from Syria over the same time period. Even Britain under right-wing Prime Minister David Cameron was able to welcome 1000 arrivals before Christmas last year. The demand to open the borders has never been more urgent.